Barnes & Noble hopped back into the tablet game almost exactly one month ago with their brand new 10-inch Nook tab, and now they’re followed it up almost immediately with a smaller, 7-inch version of the Nook. 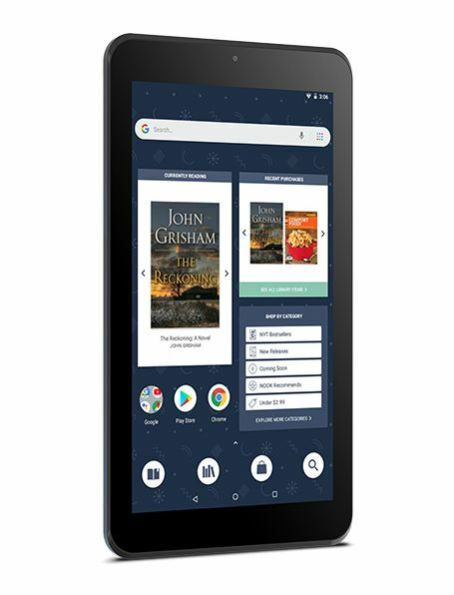 It still fundamentally works the same, allowing you to access your B&N digital book library while still keeping access to the Google Play ecosystem of apps, games, and media. It’s only $49, which is dirt cheap, but keep in mind you won’t be getting top-shelf specs here. The 7-inch display has a 1024 x 600 resolution powered by an undisclosed CPU, although Barnes & Noble is putting 16GB of storage in this device. That doesn’t sound like a big deal, but trust me, if you’ve ever looked at cheap Android tablets, it’s not common. The tablet is rated to last for about 7 hours on a single charge, which should get you a pretty decent mix of reading, watching, and browsing. I doubt it’ll be much of a gaming powerhouse, but again, for $50 I don’t think you’ve got much room to complain here. You can pick one up in stores or online right away, just in time for the holidays.